JENEsys® Edge™ products are a new generation of controllers combining the Niagara Framework® with Lynxspring's Onyxx® platform. JENEsys® Edge™ combines a controller, gateway and web server duties all into a single device - putting Niagara at the Edge with real-time control. The JENEsys® Edge™ 534 IoT Controller for Niagara 4 is a fully programmable Niagara 4 Controller with 34 IOs built-in and expandable up to 306 IOs, delivering edge connectivity, interoperability, data access and analytics for today's buildings, energy management, machine-to-machine applications and IoT environments. Taking Niagara to the edge with real-time control, the JENEsys® Edge™ 534 Controller for Niagara 4 utilizes the same familiar ProBuilder/Workbench software, Niagara programming tools and Fox Protocol. 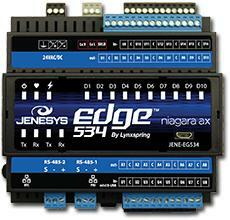 The JENEsys® Edge™ 534 IoT Controller is a fully programmable Niagara AX Controller with 34 IOs built-in and expandable up to 306 IOs, delivering edge connectivity, interoperability, data access and analytics for today's buildings, energy management, machine-to-machine applications and IoT environments. Taking Niagara to the edge with real-time control, the JENEsys® Edge™ 534 Controller for Niagara AX utilizes the same familiar ProBuilder/Workbench software, Niagara programming tools and Fox Protocol. For more information on JENEsys® Edge™ Controllers go to: resources.lynxspring.com.